This is so amazing! It is full of veggies and wonderful flavor. 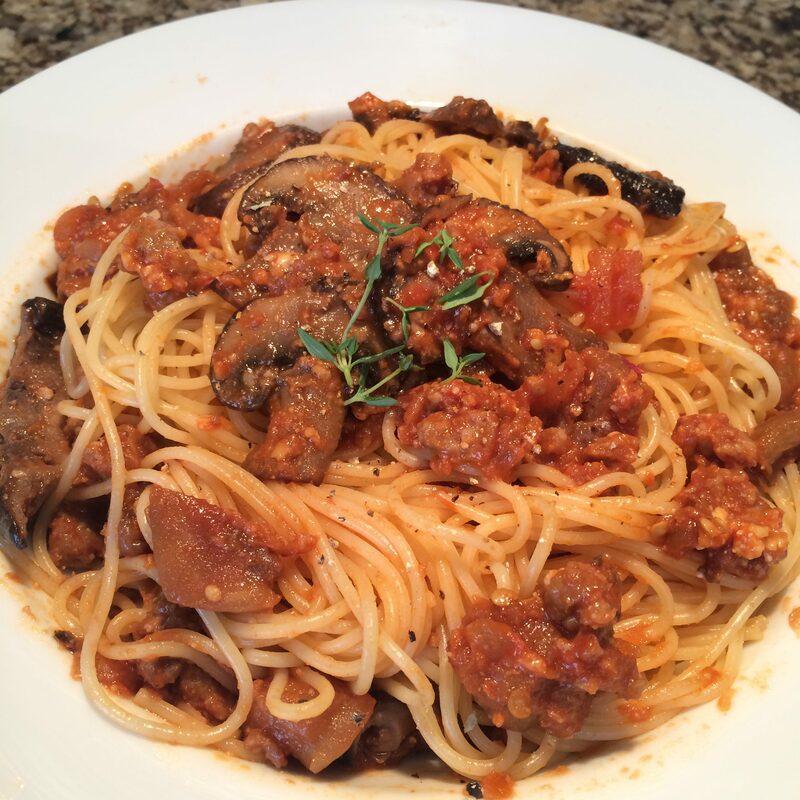 The meatiness of the mushrooms and creaminess of the eggplant really make this meal. I added spicy sausage because my husband is not a big sauce or eggplant guy. The sausage added a nice spicy kick and kind of masted the look of the eggplant. One tip, make sure that the eggplant cooks enough. You want it to be mush. And don’t forget to peel it! Heat the olive oil in a pan. Add the onions and carrots and saute for 5 minutes. Remove the sausage for the casing and add it to the pan. Continue to cook until sausage is cooked through. Drain off as much of the fat as you can and return the pan to the heat. Add in the garlic and eggplant. Sprinkle with salt and pepper and cook for another 10 minutes. Add the mushrooms, oregano, and tomato sauce. Reduce the heat and simmer for about 30 minutes. Add more salt and pepper if needed. Cook pasta according to the directions on the package then add them to the sauce, sprinkle with fresh thyme, and serve.